Applications to fill up various vacant positions under Public Health Engineering Department, Government of Assam, in prescribed format as per Annexure-A along with all relevant self-attested testimonials are invited from eligible candidates for the under noted contractual positions so as to reach this office latest by 5th January , 2017. 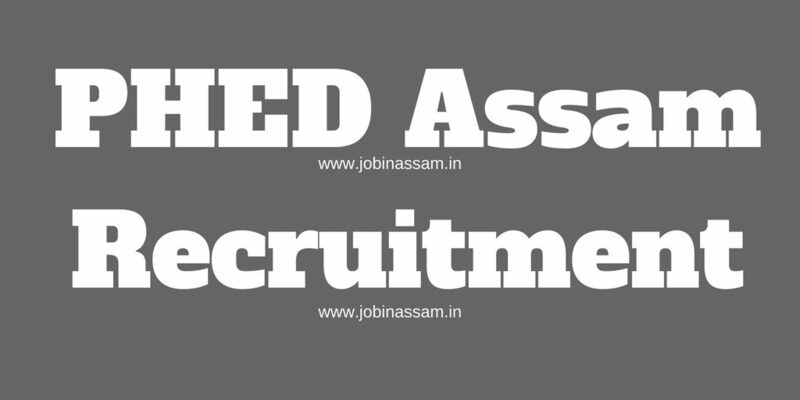 PHED Assam Recruitment 2017 invites applications from the eligible candidates to recruit in the following posts. Total vacancy is 14 Nos. Educational Qualification: Graduate in Civil engineering from any recognized institute. Minimum 5 years of relevant post qualification experience preferably in design, supervision, project management in the water supply sector/waste water (Sewerage) Schemes. Educational Qualification:Graduate /Post Graduate Degree. 3 years of relevant experience with multi sectoral development agencies// NGOs / Consultants / Government Organizations in participatory development approaches. Educational Qualification: Master degree in engineering, social science, environmental science, water and sanitation, or a related field; 3 years of professional development experience in the WASH sector, and significant project management experience. Educational Qualification: Graduate in any stream from recognized institute Minimum 1 year of relevant post qualification experience in HH survey, data entry, MIS applications, data management etc. Educational Qualification: Graduate in any stream from recognized institute. Minimum 1 year of relevant post qualification experience in office administration/file management/office correspondence etc. Last Date to Apply- 05/01/2017. Stages of Examination- There will be a selection process for the above mentioned posts of PHED. Exam Centers: All over Assam. I have shared all the important knowledge for the upcoming nnpphedassam Recruitment here. nnpphedassam jobs will be a good job for you if you are eligible for the post mentioned above, apply before the last date. Monthely pay for the PHED Assam Recruitment job is also good. Fore more about this PHED Assam vacancy like our JobinAssam facebook page and twitter page of JOBINASSAM.